As someone that is trying to find their footing with their career I try to read as many books as possible so Randi Glazer's 12 Strategies For Surviving a Career was a really great thing for me to pick up. 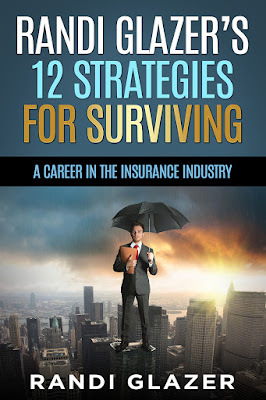 When I first on the book and without for the chance review it I didn't realize that it was just about surviving a career in the insurance industry but once I started reading the book I did see that there are a lot of things that a relatable you matter what industry you're in, and then of course that were just pacifically for people in the insurance industry. Being that I currently still have a full-time 9-to-5-ish type of job I like that Randy Glazer's book touched on a lot of things that were commonly over looked when it came to working in an office like dealing with complicated coworkers, working with people who you kind of feel are inefficient but are still your superiors and just dealing with office politics and understanding how important it is to be perceptive, think ahead, and kind of know how to play the game. My ultimate dream is to be a full-time blogger but it's not something that I know it's going to come easy. I really want to do it in an amazing way where I can possibly turn my blog into a full-fledged website so I like having something that I can refer to because like I said,while the book about having how to survive a career in the insurance industry, it really does talk a lot about dealing with working in any professional office setting and that's really important. I received this book from Amazon I got the paper back in therapy Kindle and it's pretty short 42 page book that is easy to read and like I said it is pretty relatable in any kind of office and professional industry that you're interested in getting a little bit of insight about and you want to kind of think outside the box a little and now to stick to your exact profession for $5.99 it's really not a bad purchase and I did think that I got some good insight from it.